20”, 50cm. Lies on the ground or is supported by other plants. Has round velcro-balls like burdock. White, 4-petal flowers joined together at base. Leaves also joined together in flat whorl. 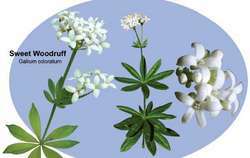 Has sweet perfumy smell and is used sometimes as a flavoring agent. Used for liver, cuts, wounds, diuretic, antispasmodic, blood purifier and tonic, cleanses kidney and bladder obstructions. Taking too much causes headaches. Very high doses can cause vertigo, paralysis or coma.